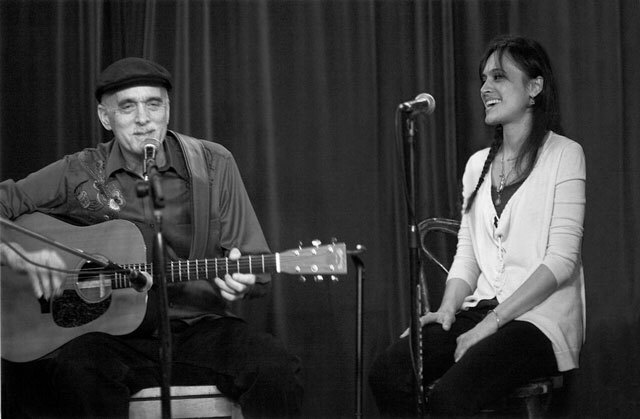 Folk icon Jim Kweskin will appear at the Circle of Friends Coffeehouse on Saturday, May 14th, at 8 p.m. Stunning vocalist Samoa Wilson will be joining Kweskin. 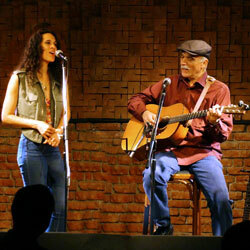 She has appeared and recorded several albums with him. Kweskin was the founder of the Jim Kweskin Jug Band, the legendary group that started in Boston in the 1960s and played Club 47. With Fritz Richmond, Geoff and Maria Muldaur, Bob Siggins and Bruno Wolfe the jugband successfully modernized the sounds of pre–World War II rural music. Jim continues to perform his vast repertoire of folk, blues, swing, jug band and early standards with his own brand of infectious personal interpretations. His guitar finger picking of songs like “Some of These Days and Exactly Like You” is recognized by his peers and fans as some of the best there is. His selection of songs is vividly evocative of his many diverse influences such as Louis Jordan, Clancy Hayes, Fats Waller, Milton Brown, Duke Ellington, Bing Crosby and Pete Seeger. The Circle of Friends Coffeehouse is a non-profit organization affiliated with Franklin’s First Universalist Society. Concerts are presented in a smoke free and alcohol free environment at the Society’s handicapped accessible Meetinghouse, 262 Chestnut St. in Franklin, and begin at 8:00 p.m.; doors open at 7:30 PM. Beverages and gourmet desserts will be available. Admission is $25. Please call (508) 528-2541 or visit http://www.circlefolk.org/ to purchase tickets or for more information.